UPSC CSE-2018 Final Results out. 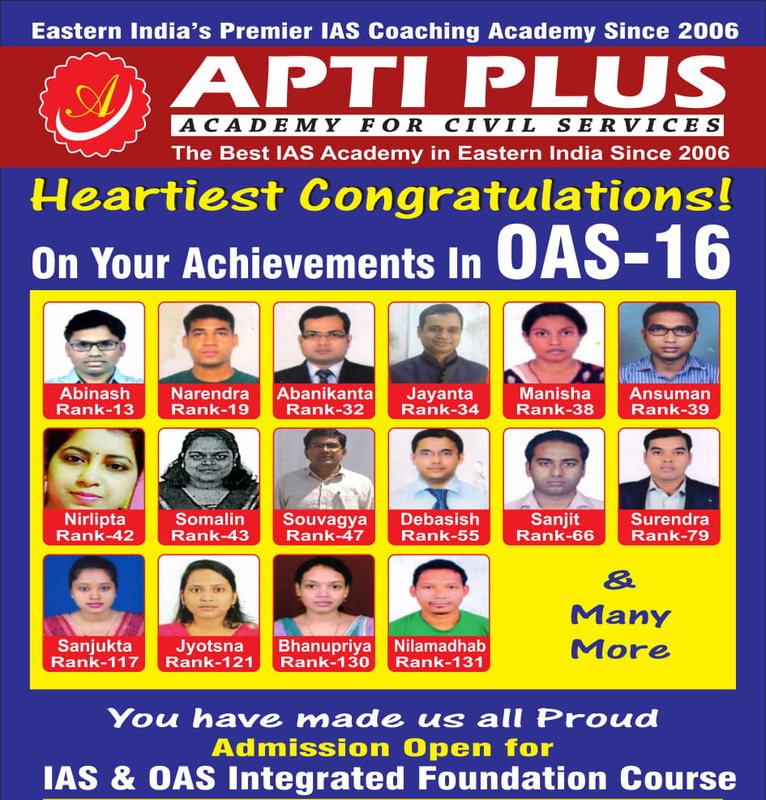 41 Final selections from APTI PLUS Academy For Civil Services. Batch Announcement:NCERT Foundation Batch For UPSC CSE 2020 Starts from 27th April,2019,To get enrolled contact your nearest centre. Talent Hunt-2019 Results out . To Check under Online Admission Section . All India Open Mock Test For CSE-19 is live now.Visit mocktest section to appear. Admission open for OAS-2019 Batch.15,000 Discount for first 50 students. Admission Open For Crash Course(CSE-2019,Preliminary Exam).To enroll contact your nearest centre. Admission Open For IAS-2020,WBCS-2020 & OAS-2019 .Classes from April 2019 & June 2019. Mock Interview Programme For CSE-2018 starts from 12th January-2019.Contact +91-9874321777 for details. Mock Tests Of IAS-2019 (Online) available on our website. Mock Tests Of WBCS-2019 (Online) available on our website. All India Open Mock Test for IAS-2019 (PRE) is Available now. Please visit http://mocktest.aptiplus.in/ to appear the Mock Test. Download E-Broucher 2019 From our website. Our Monthly Magazine 'The IAS Gazette' is now Available . Visit Our Study Material section to download. Admission Open For IAS-2019,WBCS-2019 & OAS-2018 .Classes from June 2018 & September 2018 . Mock Tests Of IAS-2018(Offline) available on our website. All India Open Mock Test for IAS-2018 (PRE) is Available now. Please visit http://mocktest.aptiplus.in/ to appear the Mock Test. Congratulations to Sachin Gupta,AIR-03,IAS-2017 & Other Successful aspirants From APTI PLUS ! ''VSTs For OAS-17 Starts from 01.12.2017.Contact 09938386166 to register"
''VSTs For WBCS Starts from 03.12.2017.Contact 08820341777 to register." To have a look at the Economic Survey 2016-17 done by Apti Plus, check "IAS Materials" Page. Mock tests & Distance Learning Programme available for IAS - 2017, aspirants may call 0882034177/08260677707 for details. The Odisha Civil Services Examination (CSE) is conducted every year by the Odisha Public Service Commission (UPSC) as a common examination for recruitment to various services like the Odisha Administrative Service, Odisha Finance Service ,Odisha Police Service, as well as Group A and Group B State Services. First the preliminary examination is conducted for screening process. Candidates qualified in the preliminary examination will only be eligible to apply for Main Examination by sending a detailed application. Main examination for OPSC 2018 is likely to be scheduled in March 2019. Candidates who will achieved the minimum qualifying mark as set by the Commission will be eligible for the Interview by a Board of competent & unbiased members. The object of the interview is to assess the personal suitability of the candidate for a career in public service. Questions asked in such interview is of general interest & is intended to judge the mental calibre of a candidate. The main examination shall consist of the following papers and each papers shall be of three hours duration. Candidates who qualify the Main Exam are called for the Interview. Number of such candidates is usually more than twice the number of likely vacancies. A total of 250 marks is allotted for the Interview. 4) LANGUAGE PAPER (Odia & English). We offer the following Optional subjects for the 2018 Civil Services Main Examination. Though we are providing only 5 Optional Subjects but classes are being taken by national and state level reputed faculties with years of experience in this field. The concise & updated study materials comprises of twelve sets in General Studies (Paper 1,2), Two Optional Subjects Papers & Essay Paper and the same will be Provided at the time of admission & in regular interval. Along with study materials, free monthly magazine will be provided to every aspirants of OCS. We are conducting total 32 Mock Tests in the 3 months duration where 12 Mock Tests will be of Full length and All Odisha level (Weekly 1 test with classroom discussion). Rest 20 mock test will be sectional and only applicable for classroom/correspondence aspirants. 25% discount to all physically challenged/Disabled students (where the percentage of disability is more than 40% & candidates have to produce the certificate in both original & photocopy). 10% discount on total fees if you are paying the total fees in a single slot & 5% discount if fees paid in 2 installments in 2 consecutive months. 7% additional discount to candidates having min 90% marks in 10th exam, 80% marks in 12th exam & 80% marks in +3 exam. 5% Discount available to aspirants whose father/mother serving/has served Indian Army, Navy, Air force, Para military force/Indian Police/ MHA, subject to submission of original supporting documents. Candidate May avail any 2 discounts mentioned above at a time w.e.f 30.04.2018. 1. The enrolment Form, completed and signed, and with a passport size photograph pasted in the space provided. NOTE : Enrolment forms without the three photographs will not be accepted. A crossed cheque/DD , drawn in favour of ”Apti Plus Academy For Civil Services” payable at Bhubaneswar.